Create craft-board trees, railroad tracks and skyscrapers, and watch children experience the joy of learning through blocks! Clear descriptions of what children learn by playing with blocks accompany the activities. Each activity considers the ability and interest level of the children, and encourages developmental skills such as problem-solving, maths, science, language, and social skills. 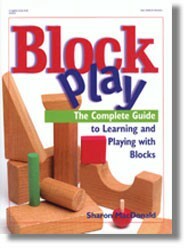 Block Play is a must-have for every teacher.